These 8 comprehension questions are a perfect way to assess student's understanding of Dinosaurs by Gail Gibbons. 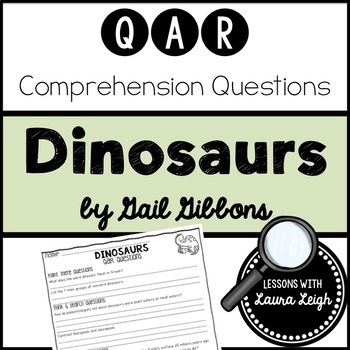 Students do not need to be familiar with QARs to complete the questions. 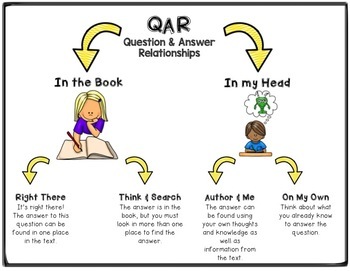 However, Question-Answer Relationships (QARs) enhance students' ability to answer questions by helping them analyze the type of question being asked. 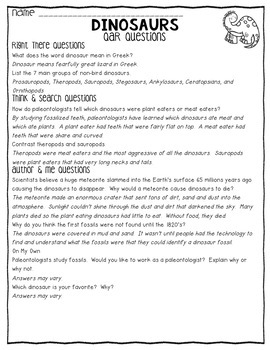 A chart of the four types of questions and where to find the answers is included in this product. Right There- The answer is in the text, and if we pointed at it, we'd say it's "right there!" Often, the answer will be in a single sentence or place in the text, and the words used to create the question are often also in that same place. Think and Search- The answer is in the text, but you might have to look in several different sentences to find it. It is broken up or scattered or requires a grasp of multiple ideas across paragraphs or pages. Author and You- The answer is not in the text, but you still need information that the author has given you, combined with what you already know, in order to respond to this type of question. On My Own- The answer is not in the text, and in fact you don't even have to have read the text to be able to answer it. By leaving feedback on your purchases, you can earn credits that will save you money on future TpT products! 2. Leave a rating and comment for the product. 3. Earn credits to save you money on your next TpT purchase! Click on the green star that says “Follow Me” to become a follower!